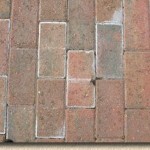 Home → Blog → Hardscape News → What is Efflorescence? Concrete contains salts that can be dissolved by water and then carried to the surface. When the water evaporates, crystalized salt is left on the surface. Over time, this may slowly erode certain surfaces (primarily brick or painted surfaces). 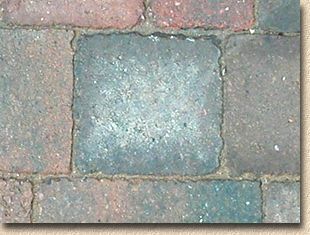 In other materials, such as well-made pavers, efflorescence causes no damage and is simply viewed as a cosmetic issue. A few compounds found in efflorescence are: sodium sulfate, potassium sulfate, sodium carbonate, calcium sulfate, sodium bicarbonate, calcium carbonate, sodium silicate, and magnesium sulfate. Some of these salts are more water soluble than others. Plenty of manufacturers today employ beneficial additives to their products in order to wash soluble salts from the base material, effectively preventing efflorescence to a large degree and sometimes eliminating the process altogether. Other changes to the manufacturing process have also been made in order to reduce or eliminate the formation of efflorescence, for example, reducing the amount of water used in concrete in order to minimize the migration of efflorescence-producing salts. While these products have a reduced capacity to effloresce, it still often happens, though to a less noticeable degree. Always be sure to buy a quality product that is able to minimize and withstand efflorescence. 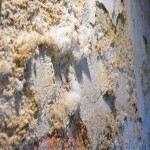 In most cases, visible efflorescence should stop being produced after approximately 1-year. Most professionals will suggest homeowners wait at least 1-year before sealing a paver patio so efflorescence isn’t trapped inside the stone. 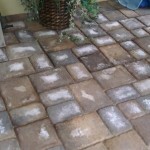 Efflorescence trapped under sealer is unsightly and difficult to remove. In extreme cases, vapor pressure or hydrostatic pressure can cause blistering or even sealer failure. 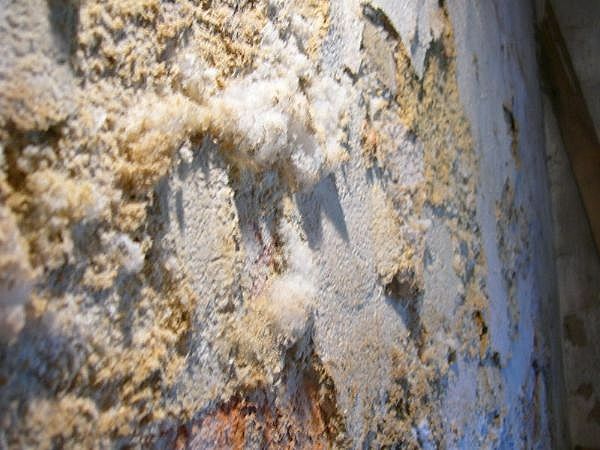 With all of this said, efflorescence is caused by so many factors, it’s impossible to accurately tell a home owner how long the efflorescence is sure to last. Efflorescence is a natural phenomenon, should disappear within a year (sometimes in weeks or months), and is best left to resolve itself. As stated above, efflorescence is a natural phenomenon, should disappear within a year (sometimes in weeks or months), and is best left to resolve itself. If you must get rid of it, try brushing it off without water using a stiff brush. Use water along with the stiff brush if a dry brush does not work, but this may be unnecessary as the efflorescence should wear itself away over time. Some people suggest adding a small amount of dishwashing soap to the water. This method may temporarily get rid of the efflorescence, but this may cause some of the salts to be reabsorbed. This reabsorbed salt will work its way out again in the near future. 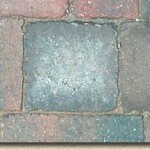 Pressure washing up to 1 or 2 times per season may also work, but is detrimental to the paving stones in the long run. Efflorescence can be chemically removed, but most sources suggest involving a professional in order to prevent significant damage to the stone/concrete. 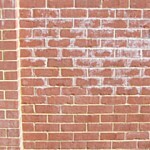 Chemically removing efflorescence typically involves treating the efflorescence with a diluted acid followed by an alkaline wash. Theoretically, the alkaline wash should “deactivate” the acid before the acid has a chance to damage the stone/concrete. Efflorescence is less noticeable and sometimes even disappears completely when wet. This makes some people think using a “wet-look” sealer will permanently get rid of the visible efflorescence. The problem with this logic is the “wet-look” just isn’t the same as being wet. 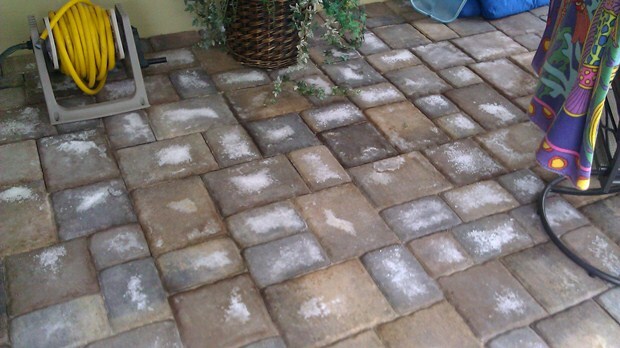 As stated earlier, most professionals will suggest homeowners wait at least 1-year before sealing a paver patio so efflorescence isn’t trapped inside the stone. Efflorescence trapped under sealer is unsightly and difficult to remove. In extreme cases, vapor pressure or hydrostatic pressure can cause blistering or even sealer failure. 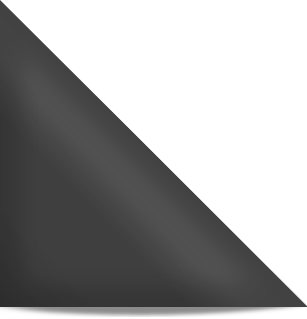 This is especially an issue with a surface-film sealer, which simply does as the name implies – forms a film on the surface of the pavers. 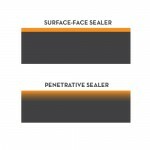 Penetrative sealer penetrates several millimeters into the surface, sealing the pores within the concrete or paving stones. Because pores under the surface are blocked off, penetrative sealant is much more effective in preventing visible efflorescence than a surface-film sealer. 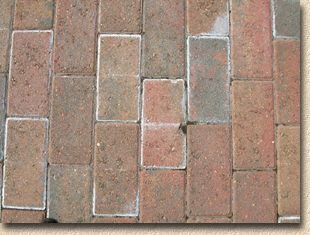 Even if using a penetrative sealer, homeowners are still strongly recommended to wait 1-year after the initial install to allow the pavers to exhaust themselves of efflorescence before applying any kind of sealer.